As our Directions API currently does not include traffic data we still show in this blog post that it is possible to integrate traffic data into GraphHopper if you have the data. A few days ago I've blogged about a simple way to feed GraphHopper with generic traffic data from elsewhere. Today we look into one specific example: Cologne. The source repository for the necessary changes is also at Github. The most important change was to visualize the traffic information directly in the browser, this helps a lot when debugging things - still lots of room for you to improve it. 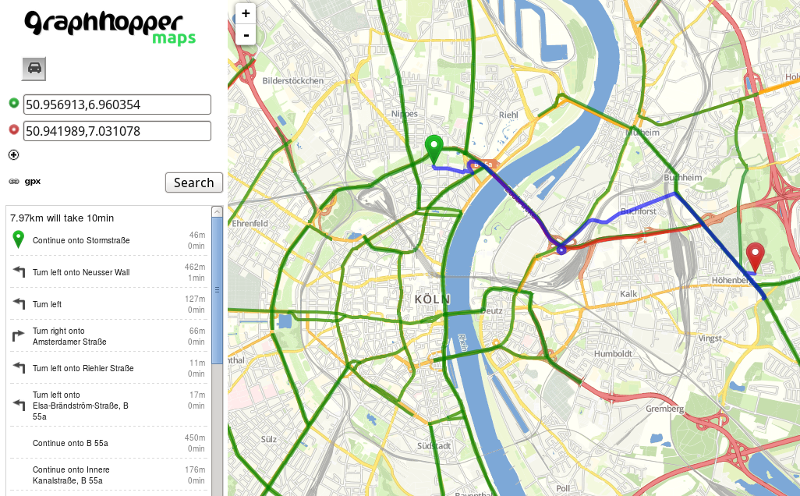 Using leaflet.canvas is a bit complex as we would need to separate the traffic information into the tiles structure. Instead I'm using the big canvas solution from CartoDB making everything really simple. See here an issue about d3js. This is only one city, but we collect more here! Now have fun to test and tweak the system!